This week in my garden I sent some of my plants to the hospital. To intensive care, in fact. If I have a plant that is struggling, I will sometimes pot it up and put it in the shelter of my backyard magnolia tree where it gets shade and some protection from the tree's big leathery leaves. Then I try to nurse the sick one along until it either recovers or dies. If it recovers, eventually I'll set it back into a garden bed in an area where, I hope, it will be more comfortable. That spot under the magnolia tree is what I refer to as my plant hospital. It's pretty crowded right now. This week I sent to the hospital three shrubs that I had added to the garden in spring: a banana shrub, Virginia sweetspire, and a spicebush. They were all in full sun and were slowly dying, even though I was watering them almost every day. I think all three of the shrubs actually need partial shade and, if I can save them, that's what I'll try to give them when I return them to the garden. The plant in the front center here is the banana shrub. It actually was not in as bad shape as the sweetspire and spicebush, but it was struggling. Time to give it some TLC. In addition to the sickly shrubs, there are several seedlings here that I just don't have the heart to stick out there in the hot Texas sun just yet. Here is a pot of sweet basil seedlings, an eggplant and pepper and a few other things. I may just transfer them to bigger pots and keep them where I can give them some protection for the summer. It's going to be a scorcher of a season, and even plants that normally prefer full sun do not really prefer the full sun that we have here. Another patient in the hospital is this poinsettia from last Christmas. I intended to plant it in a protected niche in the garden this spring, but just never got to it. Now it will stay in its pot until the weather moderates. The Texas Star hibiscus freely reseeds itself and I wind up with several seedlings every year. They germinate and get big enough to notice in the garden beds around this time of year - again, too late to plant them in the garden. So, they go into pots until I can find a home for them, maybe in somebody else's garden. I have more plants, things like a volunteer passion vine that's in the wrong place, that will be going into the hospital soon. I may have to open a branch clinic under the other magnolia tree - the one in the front yard! The high temperature today was 101 degrees. The high tomorrow is expected to be 103, a severe trial for both garden and gardener, and still no rain in the extended forecast. The sprinklers are working overtime. I don't look forward to getting our water bill for June. I'll try to be out of the room when my husband, the family accountant, opens it! The plants may be sweltering and wilting and the gardener may be sweating, but some of the garden residents are making it just fine, thank you. The little leopard frog that I showed you last week is perfectly comfortable every day on his lilypad. And he's brought a friend! A couple of feet away today was this little guy, actually sitting on a sycamore leaf that had fallen into the pond. This frog is more green while the other one appears brown, but that is a normal variation in this species. And actually my little frog didn't just bring one friend. There's a whole posse of them in the area around the pond. They go jumping around whenever I'm doing something around the pond. Meanwhile, the hundreds of green anoles in my yard have mostly gone undercover. A few weeks ago, I could hardly take a step without disturbing one, but when it gets this hot, even these little reptiles seek shelter. I do see another reptile around the yard regularly, though. Sammy, our backyard box turtle, shows up on the back porch every day looking for his meal of dry cat food and I often see him when I'm out weeding or watering. Occasionally, I even see him, along with the backyard birds, enjoying one of the sprinklers. Even turtles get thirsty. First and foremost, this is a beautiful book. It features over 5,000 meticulous illustrations, by master botanical artist David More, of the nearly 2,000 species of trees found in the forests, landscapes, and gardens of North America and Europe. 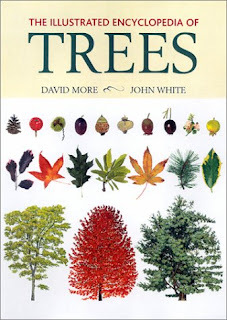 In addition to the precise paintings which illustrate the important details of trees - things like leaves, needles, bark, blossoms, fruits, nuts, and cones - More's paintings are accompanied by informative text from John White, a former research dendrologist at the UK's Forestry Commission. This is the book's second edition, the first published in 2002 and this one just out in June of this year. It is a big book, weighing in at over five pounds, but then it has to be big in order to give full justice to all those different trees. The trees are divided, quite logically, as you would expect from an encyclopedia, into families. Forty-seven distinct families of trees are represented here, from the largest ones like Cypress, Pine, Rose, and Pea to smaller ones like Dogwood, Tupelo, and Foxglove. By the way, did you know that oaks are in the Beech (Fagaceae) family? Silly me, I would have thought they were a family on their own, the Oak family, but, no, they are cousins in the Beech family with beeches and sweet chestnut. This is a book full of very useful information for a wide variety of readers. For example, landscape professionals and gardeners will find that not only are native species included, but also the many cultivars that are popular in garden landscapes. Lovers of the outdoors should find the illustrations, which show both full leaf and barer winter appearance, a great help in identifying and fully appreciating the trees that they encounter on their excursions. Even the more serious naturalists and foresters should be delighted with the inclusion of key facts concerning each tree represented here, including information on their native ranges and their dates of introduction into cultivation. For the common variety gardener like myself, one of the most useful parts of the book was the introduction. This informative section includes an extensive list of trees for problem sites or special needs. Some of the problem sites and special needs covered were: Clay Soils; Very Wet Ground; Seaside Conditions; Acid Soils; For Interesting Bark; Town Streets, etc. Of course, one has to remember that this is an encyclopedia that covers two continents and must be sure to seek out cultivars that are adapted for one's area, but this is a helpful guide that can point us in the right direction. The introduction is also where you will find an explanation of the notes that are included at the end of the description of each tree. These notes refer to the tree's height, hardiness, value in the garden, and the kind of wood the tree produces. In the back of the book are an index of scientific names and an index of common English names. David More and John White have done a masterful job, the work of several years, in collecting and collating all the information presented here, along with the beautiful and precise illustrations. It is hard to imagine a more complete and useful resource for identifying trees and their cultivars found in North America and Europe. I got a few new baby goldfish at the pet store today to add to my little pond in the backyard. I had had some deaths among my pond fish last month and I wanted to replace those three plus a few more. I waited until I was sure the pond had stabilized once again and that I wouldn't be condemning any new additions to a certain death. But the fish that survived are doing fine now and the water is clear, the plants thriving, so I decided it was time to take the plunge, so to speak. I took the fish in their plastic bag and floated them in the pond for about twenty minutes to acclimate, then released them into the water. They immediately swam away and started exploring their surroundings, while the other fish explored them. A couple of hours later, I went back to check on them and, sure enough, the pond was peaceful and all the fish seemed to be quite happy in their surroundings. As I watched the fish, my gaze wandered over to the lilypads and I did a double take. There was a tiny frog sitting on one of the leaves! Of course, I ran inside to get my camera to record the visitor. And here he is. Isn't he cute? I frequently see frogs jumping into the pond when I go out to feed the fish or to net debris out of the water, but I've never found one sitting on a leaf before. I'm not an expert on frog identification, but I believe this is a Southern Leopard Frog, Rana utricularia. It's a species that is said to be fairly common in the area, and I'm happy to welcome him to my family of backyard critters. A bit of garden art that I picked up at the Mississippi Craft Center last week. The summer solstice arrived without fanfare at 12:04 this morning, just after I had tucked myself into bed. So we can now officially say it is summer, even though it's been summer unofficially here since late May. Today will be the longest day of the year at 14 hours, five minutes. The sun and I rose this morning at 6:22 and it will not set until 8:27 tonight. I'll be setting slightly later. I got up early to start my sprinklers. I've spent much of the week watering plants, trying to make up for their neglect over the previous week. Texas sage normally sends out blooms in response to rain. There's been no rain, but there have been sprinklers and that has fooled the plant into thinking it has rained and so we have these pretty flowers. Anisacanthus wrightii, flame acanthus, is sending out its flame-like blossoms. Cape honeysuckle normally has its major bloom period in the fall, but this week it was sending out a few of these bright orange trumpet-shaped flowers that the hummingbirds love. Native datura is basically a night-bloomer that attracts moths and sometimes bats as pollinators, but if you get up very early in the morning, as I did today, you can still find its lovely blossoms fully open. The long-term forecast gives us no hope of rain and continued temperatures in the mid-90s every day. I expect my sprinklers will continue to see a lot of use in the coming week. Home again from our trip through Mississippi, visiting with family and friends there. We make this trip at this time every year and it is always a pleasure to see these folks again. One of the pleasures of driving through the countryside in north Mississippi at this time of year is that so many of the roadside wildflowers are at their peak. This meadow is typical - native grasses interspersed with Queen Anne's lace, coreopsis, tickseed, and black-eyed Susans. Queen Anne's lace is the dominant wildflower in the mix at this time. The smaller white flowers you see in the background here are one of the fleabanes. Here's a close-up of the fleabane - pretty and dainty little flowers. Stands of black-eyed Susan are common. Uncommon but always striking is the native butterfly weed, Asclepias tuberosa. It likes the soil in this part of the world and grows readily here, but you never see large stands of it as you do of other wildflowers. It's always just one or two or three plants standing out as bright accents among the other wildflowers and grasses. Driving along, one sees these accents every mile or so. Their gaudy color makes them hard to miss. Not actually a wildflower but a plant that you see everywhere in the wild here is the old tawny day lily. It escaped captivity many, many years ago and has made itself quite at home in Nature. And, of course, there is that ubiquitous wildflower, the dandelion, growing here in a cemetery. The countryside there was especially beautiful this year. They have had plenty of rain this spring and Nature has responded with a burst of blooms. I couldn't help but notice that vegetable gardens, too, looked especially healthy and productive. Mississippi plants have had a good year so far and it was a pleasure to view them. The weather is hot and humid and hot colors predominate in the garden. Hamelia patens is in its glory in the hottest days of summer. The hot pink of phlox is a mainstay of the summer garden. The 'Tropicannas' are blooming and enjoying a brief shower that we got today. Nearby, the Justicia 'Orange Flame' has got its second wind and is blooming again. Out by the pond, the red 'Texas Star,' aka swamp hibiscus, is blooming. In the pond, the water lily blooms offer a cooling note. For the next several days, with some trepidation, I'm leaving my hot blossoms and the rest of my garden in the care of my non-gardening daughter while my husband and I take to the road. While we are out of town, opportunities to post here may not come up, but I will be returning before the Summer Solstice. In the meantime, happy gardening to you. Okay. I give up. My spring vegetable garden is almost a complete failure. The corn that started out so promisingly tasseled but never developed ears. The zucchini produced a few fruits and then collapsed. Usually that means squash vine borers have been at work, but this time it seemed to be a fungal disease. The tomato vines look rather sickly. They are producing but not in the quantity that I would expect. The green beans, eggplants, and peppers are coming along but just don't seem to be growing the way they would in a normal year. They are not producing yet but I have my fingers crossed. The only thing that has really been successful so far is the tomatillos which have produced a ton of fruits and are still blooming and producing, but, on the whole, it has been a very disappointing season. I'm going to blame the weather again here. We had an unusually cool spring and I got a tardy start in the garden and so the plants were all several weeks later than they normally are. Even as they were growing, it was still quite cool sometimes at night - just not the kind of weather that spring vegetable plants expect and love. Perhaps I should have provided more added organic matter to the beds as well. For whatever reason, I'm pretty much writing it off at this point. Maybe I'll try again later. The white cat's whiskers are blooming. Behind them is celosia. The old heirloom buddleia is full of these blooms. They are not as showy as the modern buddleias but butterflies and bees love them. The red yucca is blooming among the Mexican feather grass in the bottle tree bed. Here's a close-up of the red yucca blooms. More sunflowers bloom every day. The crocosmia is beginning its long bloom cycle. It's very hot and very humid now even though, according to the calendar, summer is still a couple of weeks away. I've spent a lot of time watering plants this week, although we did get half an inch of rain on Thursday. In the next few days, we are expecting to see 100 degree temperatures for the first time in almost a year. We might as well get used to the idea. It's going to be another scorcher of a summer.